The Scent Crusher Ozone Gear Bag destroys odor-causing bacteria in your hunting clothes as well as removes the scent-causing particles left by pretty much everything you come in contact with. It works surprisingly well and as far as we’re concerned, a Scent Crusher Ozone Gear Bag is must-have gear for any deer and elk hunter. 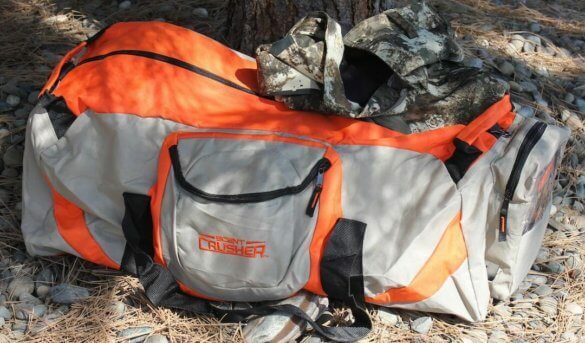 The Scent Crusher Ozone Gear Bag uses the scent-eliminating power of ozone to remove all odor from your hunting clothes. The Scent Crusher Ozone Gear Bag is basically a large duffle bag with a side pocket for a portable ozone generator. Why ozone? Ozone is a molecule made up of three oxygen atoms. It’s a strong oxidizer that reacts with other molecules, and when it comes in contact with bacteria or viruses, for example, it breaks a hole in the exterior of the bacteria, causing it to collapse and fall apart. I’m a long way from being a chemist, but rogue scents leftover from your bacon, egg and cheese biscuit are torn apart by ozone, too. All this means is that when you place most anything smelly inside the Scent Crusher Ozone Gear Bag and expose it to ozone, it’s going to come out smelling like nothing at all. Sort of. Ozone itself has a chlorine-like scent, but because ozone is so unstable, it rapidly dissipates when exposed to the air around us. 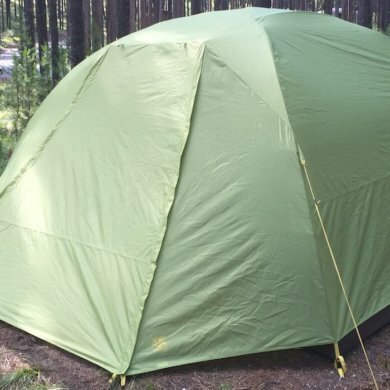 Scent Crusher Ozone Gear Bag: Does It Work? Before I took the bag on some early September archery elk hunts last year, I devised a test: Could the Scent Crusher Ozone Gear Bag deodorize a pile of sweaty, stinky workout clothes? After playing basketball for a couple of hours one day last August, I left a sweaty wet pile of three cotton shirts, nylon shorts and two pairs of socks in the garage. I let it sit overnight, and the next day, it was, as expected, pretty ripe. Instead of throwing it all in the washing machine, I tossed it all haphazardly into the Scent Crusher Ozone Gear Bag. I admit, I was skeptical. The shirts stunk. I turned on the Scent Crusher ozone unit to run for a full 30 minutes and walked away. The ozone producing-module rides in its own pocket on the gear bag and lets you choose the treatment duration. It’s simple to operate. I came back about an hour later and took the basketball clothes out of the bag. From arm’s reach away, they weren’t fully dry from the sweat from the day before. I could detect the faint smell of ozone, but no typical gym-clothes body odor. With some fear, I brought a cotton shirt up to my nose for a gentle sniff. Nothing. I tried a big sniff. Nothing. I grabbed the other shirts, same deal — the massive BO from the day before was gone. Utterly freaking gone. The nylon shorts? Same thing. The socks? Scent-free. 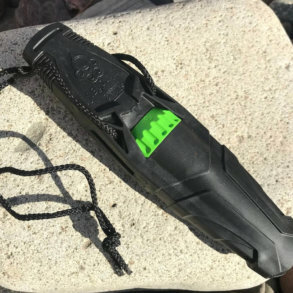 After that, I used the Scent Crusher Ozone Gear Bag on all my hunting clothing and occasional hunting bag or bino chest harness to remove scent that came from me — or from whatever my clothes came in contact with or soaked up. So why not just save some money and use a scent-removing spray? A few squirts and you’re done, right? Sort of. I still use scent-removing sprays, but mostly to spray the pickup seats and give myself and fellow hunters a hit of spray right before leaving hunting camp or the pickup. The spray, however, doesn’t penetrate down into the clothing itself very well. If your armpits left a bunch of odor-causing bacteria on the inside that have worked their way into the fibers of your clothing, a spray will have a hard time getting to it. In fact, while I can wash out most hunting gear and seemingly remove most of the odor, some synthetics manage to hold onto odor despite multiple washings. 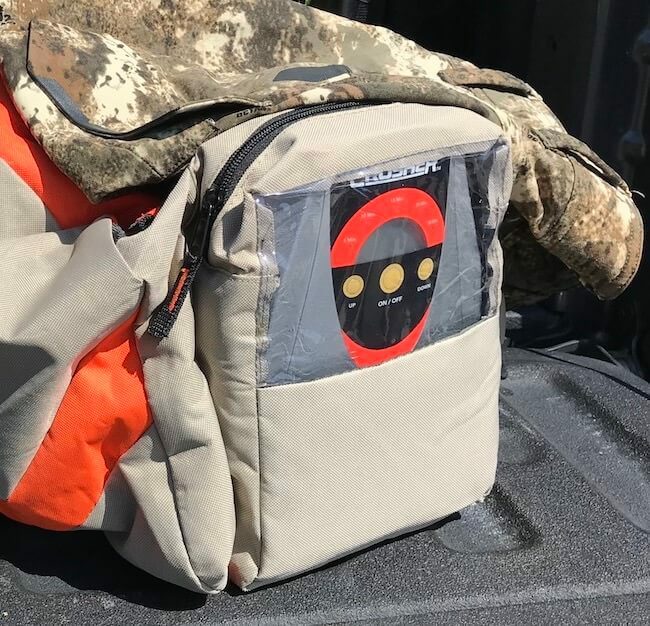 The Scent Crusher Ozone Gear Bag gets rid of it — and this has saved some of my synthetic hunting shirts from the garbage can. A lot of times I’ll return from a hunting trip and my clothes will be reasonably clean or just a bit dirty from some mud — but they had obviously picked up human scents throughout the day or on the ride home. Before I had the Scent Crusher Ozone Gear Bag, I’d wash my hunting clothes with a scent-free detergent. The process takes time and it wears out your hunting clothes. Now I just throw the clothes in my Scent Crusher Ozone Gear Bag and let ozone do the work. They come out scent-free and ready for another hunt. If there is a bit of dirt on the pants, that’s just not a big deal — don’t worry about it and get back out there. As you can imagine, if you’re at hunting camp, the Scent Crusher Ozone Gear Bag becomes indispensable fast. 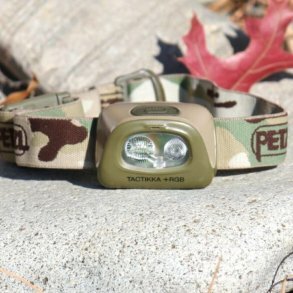 You can easily treat multiple sets of hunting gear each night. The Scent Crusher Ozone Gear Bag comes with a 12V adapter for your vehicle as well as a standard AC power cord. 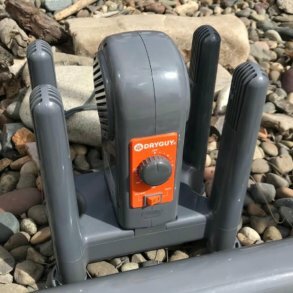 If you have a large battery pack like a Goal Zero portable power source, you can use that in more remote locations. As your hunting buddies get ripe heading into day three of your hunt, you’ll appreciate having a Scent Crusher Ozone Gear Bag on hand. The ozone flows into the bag through a flexible tube. 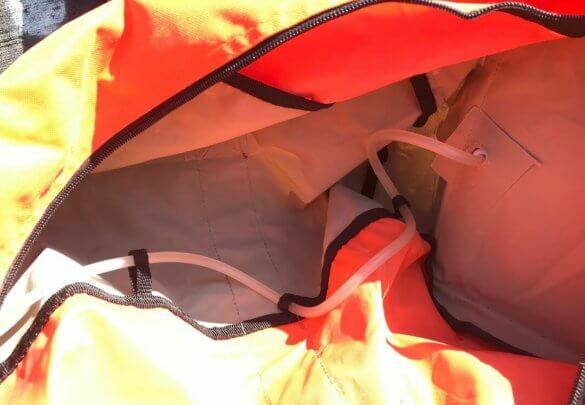 Scent Crusher Ozone Gear Bag: Does It Really Matter? So why do whitetail deer and elk hunters need a Scent Crusher Ozone Gear Bag? Elk and whitetail deer have amazing noses, and if they smell you during hunting season, even from a half-mile away, they’re gone. If you can reduce the amount of smell leaving your body, you might be able to reduce the chance that a monster buck or bull elk will smell you and bolt. Maybe. If you happen to have powerful peanut-butter sandwich breath, a.k.a. bad breath or even minty-fresh toothpaste breath, that might be enough to bust you. So even though the Scent Crusher Ozone Gear Bag will remove odor from your hunting clothing, you still need to hunt into the wind and use the wind to your advantage — at least when you’re hunting animals that rely on their sense of smell to avoid danger. Still, small advantages are sometimes the difference between failure and success. The Scent Crusher Ozone Gear Bag now has a slightly smaller ozone module in the RealTree camo version (the original is pictured above) but the ozone-producing specs are the same. 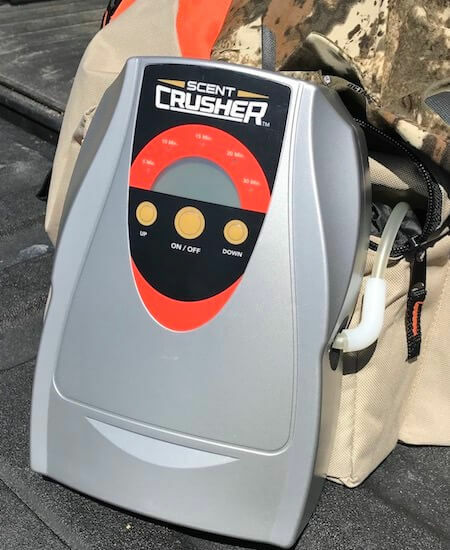 Scent Crusher has been growing as a company and now has a large scent-reducing product line that includes multi-pocket hunting bags, backpacks, portable storage closets, hard-sided totes, and in-the-field ozone producing modules that you can use in ground blinds or tree stands to pour ozone over you to destroy scent in an effort to reduce your downwind scent footprint. I haven’t used these other products, but I am a believer in the power of ozone. By far the most versatile product is the Scent Crusher Ozone Gear Bag. You can stuff it full of clothes or stuff it into your travel bags — it packs down small. Are there any cons? Yes. Ozone can eat away at rubber, so gear items that have rubber in them should be treated sparingly and for shorter durations. 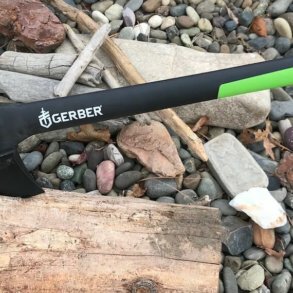 If you have some elastic rubber in your hunting pants waistband, for example, you’ll want to use the scent crusher more sparingly on your pants. For instance, before I used the Scent Crusher Gear Bag on my good hunting boots, I tested an old pair of stinky basketball shoes. The rubber soles held up well and the stink was gone, of course, but it seemed to me that a rubbery mesh panel on the sides of the basketball shoes had degraded — it seemed to have aged. Because the soles held up well, I’ve since used the bag on my leather hunting boots (sparingly) with good results. All-in-all, the Scent Crusher Ozone Gear Bag is an odor-reducing system that works surprisingly well, which is also why the Scent Crusher Ozone Gear Bag is one of our 45 Best Gifts for Hunters. Scent Crusher has made a couple of different versions of the bag and has updated the ozone module with a newer digital interface and slightly smaller overall design. The original ozone module pumps out the same ozone specs and works just as well as the newer version, so don’t hesitate to nab it if the price is lower. In fact, Cabela’s still has some Ozone Gear Bags with the original ozone module design, and they come with a bonus — a free Ozone Go mini ozone module that can help eliminate smells in your vehicle. 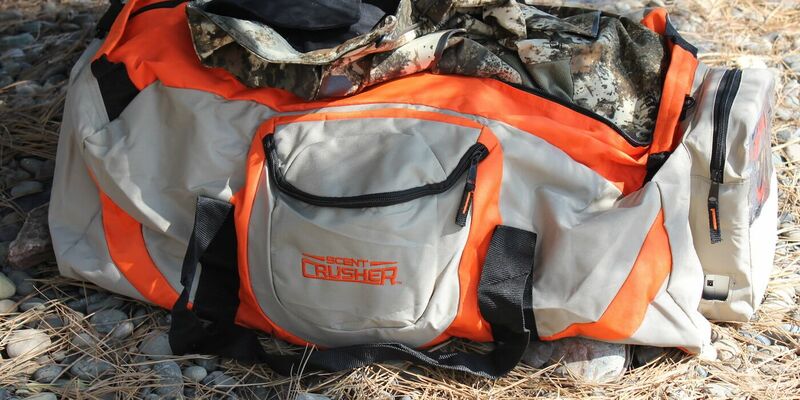 Whichever Scent Crusher Ozone Gear Bag you choose, it’s worth it. Very highly recommended.